Two pairs of sculptures are represented, one of centaurs and one of sphinxes. 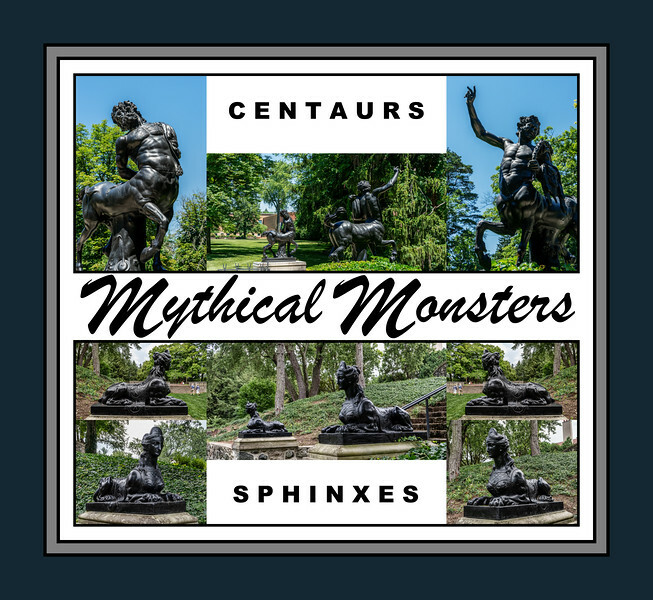 The centaurs are along the southern edge of the area associated with the Cranbrook Museum of Art, near Lone Pine Road and the Nichols Gate. The sphinxes are at the foot of stairs that lead down from Cranbrook House to one of its landscaped terraces. The pair of lead sphinxes are copies from Greek sculptures and were purchased by Henry Scripps Booth in 1963 in England. In Greek mythology, the Sphinx is a monster with the body of a lion, the wings of an eagle and the head and upper torso of a human female. Another amazing collection for M day! Love this and I've always been fascinated by the Sphinx. Clever Mythical Monsters--don't think this one would have come to mind. Great. Fabulous "M"! Lots of planning involved in this one....terrific work! Good collage and inventive 'M' shot!